Golden Dream, along with dingier Hu Pin, is one of Nyaung Shwe’s longer-standing hotels. Ad Book now! Rates from US$16.58++. Average rating 8.4 from 97 reviews. Unlike Hu Pin, Dream has seen a bit of TLC put into their rooms. It doesn’t exude charm from the exterior -- it’s a three-storey concrete block painted beige -- but the rooms themselves are pretty good. If you favour a more classic hotel style, their rates are going to be lower than the newbies going up around town, and their spacious rooms are reasonably well maintained and comfortable. Superior rooms are simple but feature ensuite hot water bathrooms and air-con, while deluxes have the bonus of a couple of paintings on the wall and a bathtub. Mattresses aren’t bad, the furniture is decent enough and the all-white tiled bathrooms clean. Also in a town where ‘family’ frequently means one kid only, it’s good to find that their large family rooms do genuinely sleep four. WiFi and electricity are as unreliable as anywhere else and their breakfast gets mixed reactions but a nice touch is free bicycle use for guests (though they aren’t normally expensive to hire anyway). An open rooftop cafe with fine views is used during dry season only. Location has pros and cons. It’s at the bottom of Yone Gyi close to the canal. The cafes and restaurants on the main drag are easy to reach (Inle palace is next door), but we reckon the lower front rooms could get noisy. Second floor rooms are best and come with good views too. Staff are friendly and helpful. This is a good fallback option if your favoured guesthouse is full, as with plenty of rooms you’ll likely find availability here. High season rates jump up a bit, but then they’re not the only ones to do this. 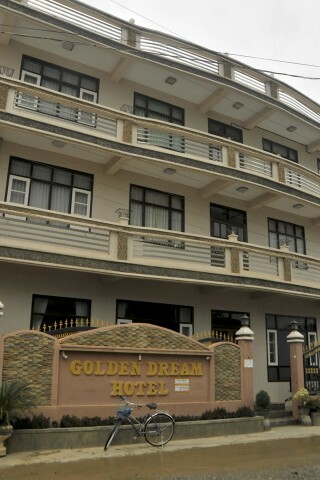 Check rates at Golden Dream Hotel on Booking.com.